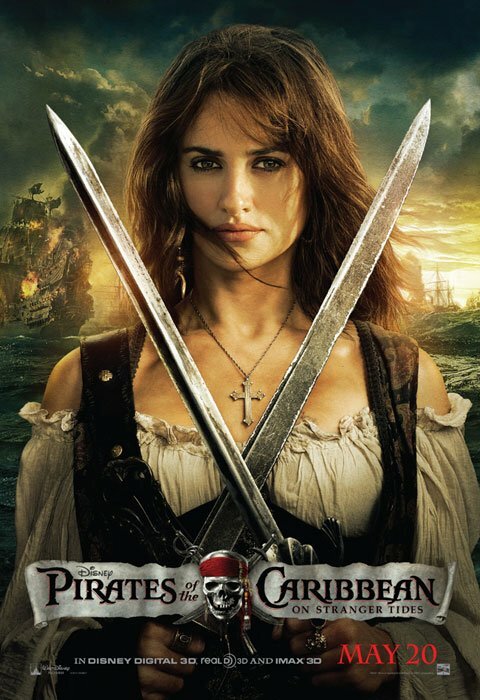 Just yesterday we posted a new one-sheet for Pirates of the Caribbean: On Stranger Tides. A close-up of Johnny Depp as the legendary Captain Jack Sparrow, I commented that it was one the ladies would love. Today I've received something for the men in the audience. Disney has sent out yet another character poster, this time the focus squared directly on franchise newcomer Penelope Cruz, who plays Angelica in the film. Both one of Jack's former lovers and the daughter of the villainous Blackbeard, she's just one of the many problems the good captain has to deal with while on the search for the Fountain of Youth. Check out the poster below and click on it to see it full size. For more on Pirates of the Caribbean: On Stranger Tides, be sure to check out our Blend Film Database.